Updated 2:30 p.m. Eastern with test details. FREMONT, Calif. — SpaceX test-fired Feb. 3 the first flight version of the Raptor engine the company has developed for its next-generation launch system. SpaceX Chief Executive Elon Musk announced the test in a series of tweets late Feb. 3, a couple hours after observers near the company’s test site in McGregor, Texas, has seen and heard what appeared to be an engine test of some kind. 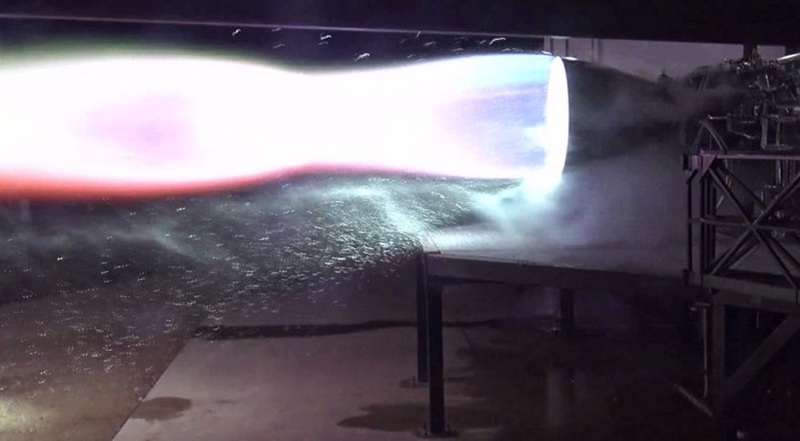 “First firing of Starship Raptor flight engine! So proud of great work by @SpaceX team! !” Musk tweeted. Videos of the test, also posted by Musk, showed the engine firing for a couple of seconds before shutting down. SpaceX reported in an Instagram post Feb. 4 that the the engine fired at 60 percent of its rated thrust, or about 255,000 pounds-force, with a chamber pressure of 170 bars. SpaceX has been working on the Raptor engine, powered by methane and liquid oxygen propellants, for several years, and conducted the first test of a developmental version of the engine in September 2016. The engine tested here, though, is a flight model, intended for use on the “hopper” test article of the company’s Starship reusable launch vehicle under development at its South Texas launch site. Both the launch system, previously known as Big Falcon Rocket and Interplanetary Transport System, and the engine have undergone design changes since that initial test more than two years ago. While SpaceX plans to develop optimized versions of the Raptor for both the Starship upper stage and the lower booster stage, now called Super Heavy, SpaceX is, for now, working on only a single version of the engine for both. Musk also said in December that the Raptor had been “radically redesigned” from prior versions, but did not elaborate then on the changes. At that time, test-firing of the new engine was scheduled for January. With an initial thrust of 440,000 pounds-force, the Raptor is somewhat less powerful than Blue Origin’s BE-4 engine, which also uses methane and liquid oxygen and produces 550,000 pounds-force of thrust. Development of the BE-4 will be completed later year, Bob Smith, chief executive of Blue Origin, said at a Jan. 25 groundbreaking for a new factory in Huntsville, Alabama, that will produce the engine for both United Launch Alliance’s Vulcan and the company’s own New Glenn rocket. Those unforeseen issues include high winds the toppled the upper, nose cone section of the vehicle last month. Musk said Jan. 23 that it will take “a few weeks” to repair that section of the vehicle.